From Diaper Changes, Tummy Time to Infant/Parent Classes The Plush Pad® is the multi-purpose memory foam surface for your baby. It's great to use on-the-go or around the home -- in any room or any place. The Plush Pad® is in a category and class of its own. It is definitely not just a changing pad. We consider The Plush Pad® a portable changing station, because the memory foam makes it comfortable enough to be used all the time - in another part of the home, during extended stays with the grandparents, while on vacation at hotels, or to reclaim counter space for parents with smaller living spaces. You can also simply roll it up and take it with you daily on-the-go. Another popular use is during tummy time and Mommy & Me classes when the baby begins to practice lifting their weight up with their arms or just needs a soft spot to exercise or relax. Style meets practical. Baby meets plush. Sure, there are portable vinyl and plastic pads available in all sorts of gimmicky shapes or that come in your diaper bag as a freebie, but they are all still cold, hard, and meant to be wiped down with a sponge. We know there is a market for parents who demand comfort for their infants as well as portability. Design: The common changing pad is designed with a folding fashion in mind. These folds leave awful creasing which seems to keep the pad caving in on itself. This can be irritating when all a parent wants to do is lay their baby down for a quick change. The Plush Pad® addresses this issue by rolling open much like a yoga mat. You simply slip off the fastening loops and The Plush Pad® rolls open easily, ready to welcome your baby. Mom-Invented Ah Goo Baby® founder, Karin Telegadis, was constantly frustrated by the changing pads offered in even her most high-end diaper bags and also tired of getting resourceful with changing surfaces while traveling with her babies. Several events inspired her: It didn’t matter how expensive the diaper bag - all of the pads were made of vinyl and were stiff and cold. It was more desirable to risk my pashmina wrap as a changing surface, than to bother digging for the changing pad in my diaper bag. Never seemed worth the hassle. My kids always squirmed, rolled off of it, or were generally irritated by the lack of comfort. With a flight of stairs between the kitchen and my baby’s nursery, I set up a second changing station on the first level to avoid treks up and down for every diaper change; but the bulky foam station was an eyesore and eventually rubbed the finish off of my dining room table. I realized from friends with smaller living spaces in New York that something comfortable yet portable could allow them to also reclaim counter space without sacrificing their baby’s comfort. All of the trips taken during my children’s’ infant phase would have been much more pleasant with The Plush Pad®. Being in a hotel room can be trying for anyone with an infant. You wish it could feel like home, but it’s difficult to replicate your baby’s nursery. Most times, I’d resort to a towel as a changing station or get stuck using the sticky vinyl pad 24/7 during the trip. Then came the in-laws. Have they not already paid their dues raising us? Now they have to set up a complete nursery for when the grandkids visit? In most cases, grandparents want to keep their guest room, a guest room – not a nursery. Wouldn’t they love to be able to lay out a luxurious changing station for their beloved grandchild, yet compactly store it when there is no need for it? All of the Music Together and My Gym classes would have been a pleasure with The Plush Pad®. Having a soft and clean surface for my infant to lounge and exercise on would have been a great alternative to the plastic mats and hard wood covering the floors. At home when my children were about 6 months old, they began flipping over on their bellies and lifting themselves up on their elbows and hands. Our rugs were abrasive, and blankets were never quite "cushiony" enough to keep them comfortable and safe from chin-falls after failed attempts to prop themselves up. Comfort and safety applies here with The Plush Pad®! Celebs Love it! The Plush Pad® is now owned by a growing list of high-profile, celeb parents who have recently welcomed (or will welcome) babies into their lives - including Jessica Alba (who has 2), Naomi Watts, Rebecca Romjin (recent request for her baby shower), Toni Collette, Cate Blanchett, Nicole Kidman, Patrick Dempsey, Allison Sweeney, Samantha Harris, Jenna Elfman, Marcia Cross (who also has 2), Amanda Peet, Jason Priestly, Jamie Pressley, Elisabeth Hasselbeck, Kristy Swanson, and more. What Makes It So Plush? The Plush Pad® by Ah Goo Baby® comes with a memory foam pillow that relieves pressure because its structure is completely different. It's made up of billions of high-density, elastic micro-cushions. When the temperature-sensitive cells come in contact with the warm areas of your baby’s body, they get softer and pliable. In cooler areas, they stay firm. The cells will literally shift position and reorganize to conform to your baby’s tiny contours. The cells shift so your baby doesn’t have to. Its molecular structure also efficiently absorbs shock to help protect your baby’s head and neck when laying them down for a changing. In short, the Plush Pad® conforms to the curves of your baby’s body, so that they can sit back, relax and enjoy the experience! Patented Rolling Design : The patented design is built similar to a traditional pillow, in that the high-density memory foam acts as the cushioning, a water repellent taslin fabric covers the pillow protecting it from accidents, and the two are then slipped into the outer cover. The center piece of the Plush Pad® covers the memory foam pillow (which is where most of your baby’s body will rest) with a fold on either side that together acts as an extended barrier for your baby’s arms and legs. When you are finished with each changing, you simply snap the folds together, roll it up, and secure it with the woven elastic loops. Its Many Uses : The Plush Pad® brings the comfort of the nursery with you everywhere you go with your baby. Its patented design incorporates a thick, body-contouring memory foam cushion to sooth and support your baby's sensitive pressure points. Plenty of wiggle room (approximately 2 ft. x 2 ft.) for the baby, yet ultimate portability to easily fit in one's diaper bag, suitcase, or to store away when not being used. The Plush Pad is used constantly (24/7) around the home; no need to run to the nursery for every change when you have The Plush Pad®. 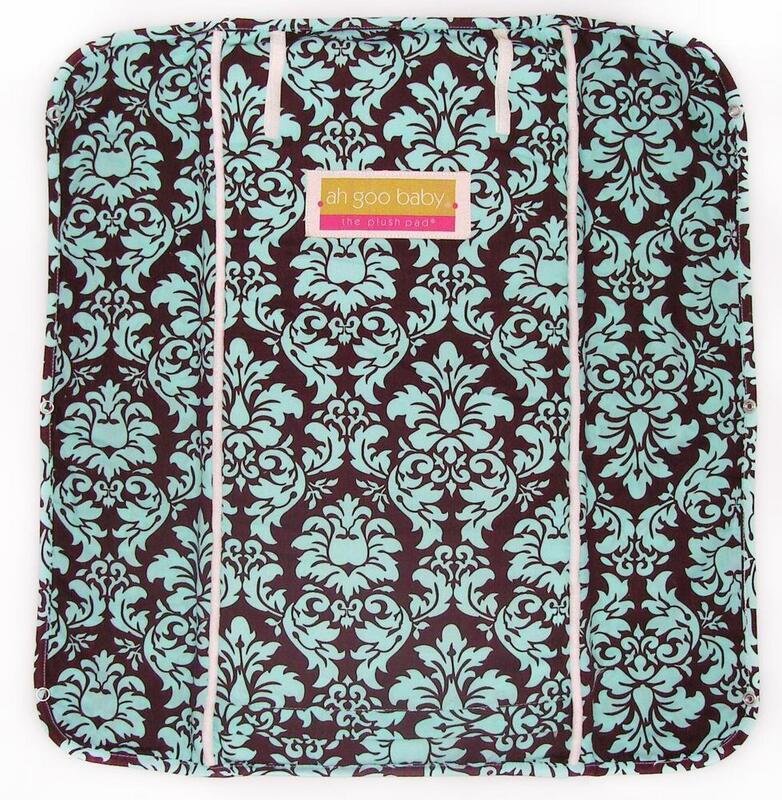 Replace the plastic/vinyl changing pad in one's diaper bag withThe Plush Pad®, for a really comfortable daily change for baby.